Apple is planning on introducing triple-lens cameras in its 2019 iPhone lineup, reports Bloomberg, confirming many triple-lens camera rumors that we've previously heard. Like The Wall Street Journal, Bloomberg says the followup to the iPhone XS Max will feature a triple-lens camera arrangement, with the iPhone XS and iPhone XR successors to use dual-lens camera arrangements. The third camera will allow for a larger field of view, a wider zoom range, and it will capture more pixels. Apple is apparently working on a feature that would use that extra pixel data to provide tools for automatically repairing a photo or a video to fit in a subject that "may have accidentally been cut off from the initial shot." An enhanced version of Live Photos is also in the works, increasing the length of the attached video to six seconds. 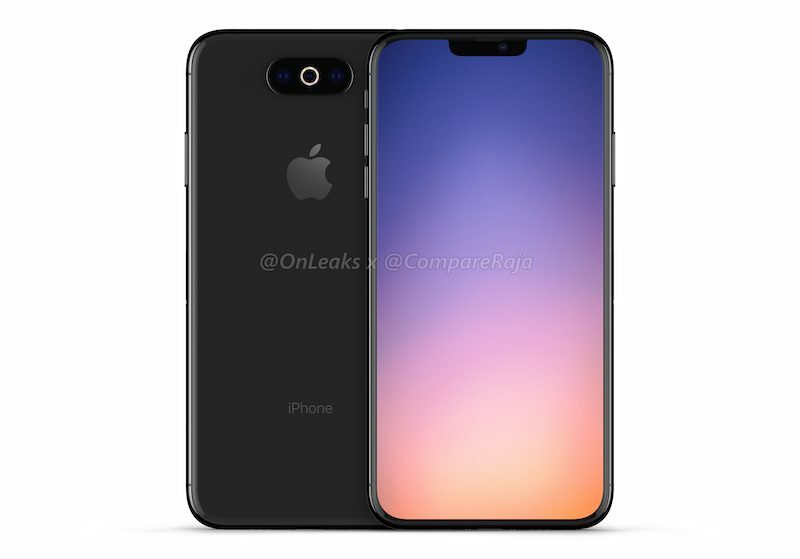 Some versions of the 2019 iPhones Apple is testing use a USB-C connector instead of a Lightning port, which could mean Apple plans to switch from Lightning to USB-C at some point. An upgraded A-series processor and a new Face ID sensor are planned, but the devices are expected to look similar to this year's model. iPhone camera technology will become even more advanced starting in 2020 as part of a push to further Apple's augmented reality ambitions. According to Bloomberg, the company will debut laser-powered time-of-flight 3D cameras that will result in significant improvements to AR experiences on the iPhone. A time-of-flight (ToF) camera system uses a laser to calculate the time that it takes for the laser to bounce off of objects in a room, using the data to create an accurate 3D image of the surrounding area. This allows for more accurate depth perception and better placement of virtual objects, and it will also result in photos better able to capture depth. Bloomberg says that the camera will be able to scan areas up to 15 feet from the device. Apple's front-facing TrueDepth camera uses 3D technology but because it's infrared and not laser-powered, it only works at distances of 25 to 50 centimeters. Sony could be Apple's supplier for the new system, with Apple in talks with Sony over sensor tests. Prior to when the new iPhones are released, we could see the first appearance of the 3D camera system in an iPad Pro upgrade planned for spring 2020. Apple is not planning a major iPad Pro update for 2019. There were originally some rumors suggesting Apple would introduce a 3D camera system in its 2019 iPhones, but reliable Apple analyst Ming-Chi Kuo said that wouldn't happen as Apple needs 5G connectivity, augmented reality glasses, and a more powerful Apple Maps database to truly take advantage of the AR capabilities afforded by a ToF camera. Bloomberg confirms that Apple was indeed aiming to put the 3D camera system in this year's iPhones, but ultimately delayed its plans. Apple's 2020 iPhones will also feature triple-lens arrangements, improved photo capturing tools, and more powerful processors. Bloomberg suggests it could be a prelude to an AR headset, and past rumors have indicated Apple could launch that device as early as 2020. Only the big phone gets it? Thats a bummer. The Xs is IMO the perfect size phone. A time-of-flight (ToF) camera system uses a laser to calculate the time that it takes for the laser to bounce off of objects in a room, using the data to create an accurate 3D image of the surrounding area. LASIK eye surgery: now bundled with your iPhone. Came here to post this. The withholding of features from non-Plus models was really annoying in the pre-X phones. I'd hate to see that back, as someone who believes in at least somewhat pocketable phones. I really really hope the cameras make it to all the phones. Having to buy a bigger phone just for feature X is really annoying. I won't be buying the phablet. iphone sales dropped by 15%... so i'm calling a 150 dollars price increase for next iPhone..
One day, the back of phones will be a matrix of cameras. This reminds me of the Mad TV’s Mach 20 razor ad. The iPhone is rapidly becoming a camera with a phone built in. That's a lot of tech (and expense) for photos and videos. More lenses, a faster processor and photo capturing tools in a device that looks the same as the current models. Who the hell gives a s*** about any of this? Do they really think any of this will encourage people to upgrade? Nope. It's like they're not even trying.